On my daily walks (~2.5 to 3 miles a day), I enjoy listening to various podcasts. One podcast I enjoy listening to from time to time is the ChooseFI podcast. While most of the concepts presented on the show are not new to me, it’s interesting to hear the various ideas of financial independence (FI) presented as well as interviews with notable financial bloggers. One episode I recently heard and really enjoyed is called The Pillars of FI. I think the hosts of this episode did a great summary of the fundamentals of financial independence. It’s a great reminder of the things we need to focus on as we pursue our financial freedom. Here are the pillars of financial independence discussed on the episode. It is consistently proven time and time again that financial experts cannot consistently pick stocks or funds that will beat the average market returns over time. Actively managed funds may on occasion beat passive index fund investing, but they don’t usually earn enough to make up for their expensive fees. While an individual stock may skyrocket in value, it may also plummet in value. I wouldn’t trust our entire retirement portfolio to a few hand picked individual stocks. If you really want to make money on individual stocks, you need to take high risks and put a lot of money (and risk) into those stocks. On the other hand, index fund investing has low costs, broad diversification, and reliable long term growth. Read Jim Collin’s stock series for more information on index fund investing. Early in my investing career, I made the mistake of not investing as early as possible. My first full time job did not offer a 401K retirement plan; I responded by not bothering to invest. I kept telling myself that there would be plenty of time to invest once I started making more money. When I finally opened a Roth IRA, I went with Edward Jones. My Edward Jones financial advisor sold me on expensive funds with high expense ratios and a 5% front load expense. For every $100 I contributed, the firm took $5 off the top. I’m glad that I learned about Vanguard and low cost index funds. I was charged a $40 fee for closing my Edward Jones account to transfer all of my money into a better place. Studies consistently find that investors that try to dance in and out of the stock market and time their purchases and sales tend to lose more money than investors that stay invested. Fidelity investments did a study of the portfolios that performed the best from 2003 to 2013 and they found out that the best performing accounts were from investors who were dead! Since they didn’t touch their accounts, the balances were left to grow over time. The second best performing accounts were from investors who had forgotten that they even had accounts at Fidelity. Investors who try to chase performance or those that buy high and then sell low when their investments don’t perform do not earn as much as those who simply buy and hold. When trying to time the market, you need to be right two times: when to sell and then when to buy. It’s a loser’s game. Since your rent or mortgage is likely the largest expense, it is important to keep your housing expenses low. I made a mistake of buying a house that was too large for my needs. When I first started making good income, I bought the most expensive house that my income allowed me to get financing for. This made me feel house poor for several years. This is when I got creative and decided to rent out the extra rooms in my home to bring in additional monthly income. Once my wife moved in and we combined our income, I finally felt much better about owning our home. Our house is on track to be completely paid off in 13 years. For those looking for housing in high cost of living areas, consider having a roommate to cut down on costs and share expenses. Do you want to be financially free or live in a nice place you can’t spend time in since you have to work hard to afford the payments? If I could go back in time, I would have looked to purchase a smaller home with less space to build up clutter, lower mortgage payments, and less property taxes and insurance costs. Monthly auto loan or lease payments can hold you back from achieving financial independence. One of the pillars of financial independence is buying a used fuel-efficient vehicle and driving it as long as possible. Owning a car has many extra expenses such as regular maintenance, fuel costs, repairs, vehicle registration fees and auto insurance. Higher end luxury vehicles need more expensive fuel, have more expensive upkeeps, and have higher insurance and registration costs. Having a car can be a huge money pit. This is why many financial bloggers recommend biking / walking to work if possible, completely eliminating the need for a vehicle and its related expenses. Years ago, my wife and I both sold our paid off cars to buy new ones. Looking back, I definitely regret selling those vehicles. They still had many years of life left in them. While many financial bloggers recommend buying used, I bought a brand new Lexus IS250 in 2008. We leased a Prius for my wife in 2013. I definitely regret leasing the Prius - what a waste of money. At $342 a month for 36 months, that’s $12,312 that could have gone towards investments or even a high quality used vehicle. When it was time to return the Prius lease, we decided to purchase a new car in cash – and be completely done with car payments. We expect many years out of our paid off cars. My dream is actually to be car free. If public transportation were more feasible in our area, I would be all over it. I’m looking forward to a time when self-driving vehicles can bring us where we want to go; I personally hate driving. I have to admit, we love eating out. We consider it a special treat to go out to eat at a restaurant. That being said, we really don’t eat out that often, maybe 1-2 times a week. We pretty much bring our lunch to work every single day. Most of the time, we enjoy a home cooked meal. Good food doesn’t take long to make, and you can be sure all the ingredients are fresh and healthy. There’s no need to get into your vehicle, drive to a restaurant, wait to get served, and then tip at the end. Preparing your own food is faster, cheaper, and much healthier than eating out. Did anyone else catch the story about a frog found in a BJ’s Restaurant salad? Many financial experts recommend maxing out a 401K since it lowers your adjusted gross income (reducing your taxes), and also allows you to invest more money up front pre-tax. Without getting into all the details now, there are strategies of withdrawing money from your 401K before the standard withdrawal age of 59.5. There are even methods to keep your tax rate of withdrawals very low. The best part of investing in your 401K is that your 401K pre-tax deposits happen automatically. You are dollar cost averaging your investments consistently with each paycheck. Over time, you just get used to living off the remainder of what your paycheck provides – you won’t miss those contributions. If you can’t afford to max out your 401K right away, slowly increase your contributions as your pay increases. With the help of scholarships, financial aid and cheaper college tuition due to attending public schools, my wife and I were both lucky to graduate college with very little debt. College and higher education costs have skyrocketed today. I hope there is some type of college costs reform in the future by the time our son is ready to attend college. In the meanwhile, we have already started a 529 account for him at Vanguard. While we feel it is important to help our son with his future college expenses, we also know that it is even more important to make sure we secure our own financial freedom. As the saying goes: you can take out loans for school, but you can’t take out a loan for retirement. This is a big one for me and my family. Properly utilizing credit cards, rewards points and airline miles have been a huge part of our financial journey. While I love my job, I love my 7 weeks paid time off even more. Going on vacations helps to keep us sane and breaks up the monotony of our weekly work routines. Credit card points and miles have allowed us to travel the world without breaking the bank. 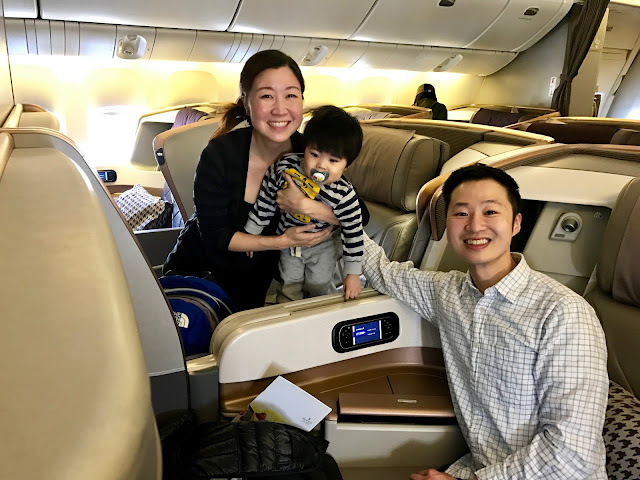 We’ve even had the chance to fly Cathay Pacific First Class and Singapore Airlines Business Class – experiences we would never pay for with cash. We’ve used our points on ourselves, and have also shared them with family. Thanks to extra miles we had, we will get to treat my father to his first business class flights – he’s quite excited. I regularly write about how much money we save by paying for flights and hotel rooms with points. While canceling your cable or satellite television won’t make you rich, it may reduce your monthly expenses by $50 to $150 per month, which can go towards investing. The most important part about canceling your cable (or any other subscription) is that it keeps you mindful of where your money is going. If your cable bill is $150 a month, are you getting $150 worth of value from the expense? With streaming services such as Netflix, Amazon Prime, and HBO Now, it’s easy to activate and suspend service as needed. With Amazon Prime, you can watch television and movies a la carte and if you really want to watch something specific that you can’t stream for free. $100 a month invested at a 7% rate over 10 years will return over $17,700. We get our phone bill covered through my employer since I occasionally need to be on call for the hospital when my patients need access. If I didn’t have our $100 a month cell phone bill covered, I would look into cheaper cell phone plans such as those offered by Republic Wireless. Striving for financial freedom involves attitudes and actions that go against the grain of mainstream consumerism culture. Society tells us spend on money on material things. Clothing designers try to sell consumers on fast fashion - style trends that come and go in a matter of months. Traditional financial pundits recommend saving 10% of your income for 30-40 years, and you might get a chance to retire at age 65. Traditional financial advisors talk about focusing your retirement goal on replacing 80% of your income, when only your yearly expenses should be used as a guideline. I first learned about financial freedom when I stumbled upon the Mr. Money Mustache blog. Start by reading this post, titled Getting Rich: from Zero to Hero in One Blog Post. Mr. Money Mustache has opened my mindset up to the unconventional thinking involved with truly getting rich quickly. No fancy stock trading tips or gimmicks, just cutting back on expenses, saving much more than traditional financial pundits recommend (at least 50% of your income), and investing the difference. Being frugal doesn’t mean being cheap – to me it means cutting out wasteful spending and consciously choosing to spend your money on experiences or quality things that truly make you happy or add to your life. Striving to reach for financial independence involves thinking outside the box. So there you have it, the pillars of financial freedom. What are you working on to move closer towards your own financial freedom?